Browsing 11 posts in speaking. Wow! What an amazing 4 days! I’m so grateful for those of you who were able to make it out to see me. 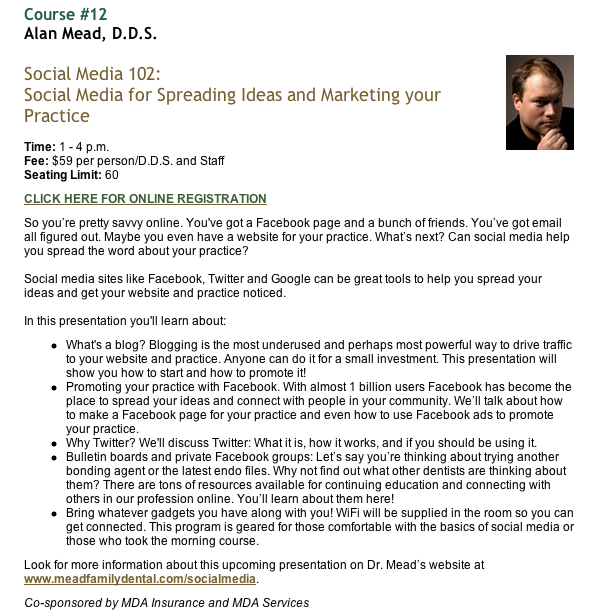 If I can answer any questions please feel free to email me at: alan@meadfamilydental.com! See you next year! I’m a sell out and proud of it! I’ll be speaking at the Michigan Dental Association annual session again this year. We’re more than a month away and one of my courses has already sold out! How exciting is that! There’s still room in my two other courses: “Be Found and Be Remarkable: ” and “Addiction, Drug Seekers and the Michigan Automated Prescription System: Shedding Light on a Silent Epidemic.” If you’re interested in seeing what these courses are about or signing up, go to the Michigan Dental Association’s Annual Session page. 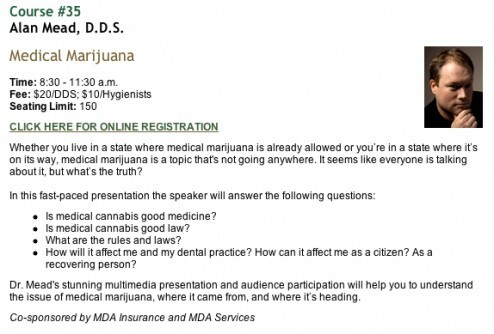 It’s got all the details on a dental meeting that is amazing every single year! And thanks to those that have made me a sell out again this year! 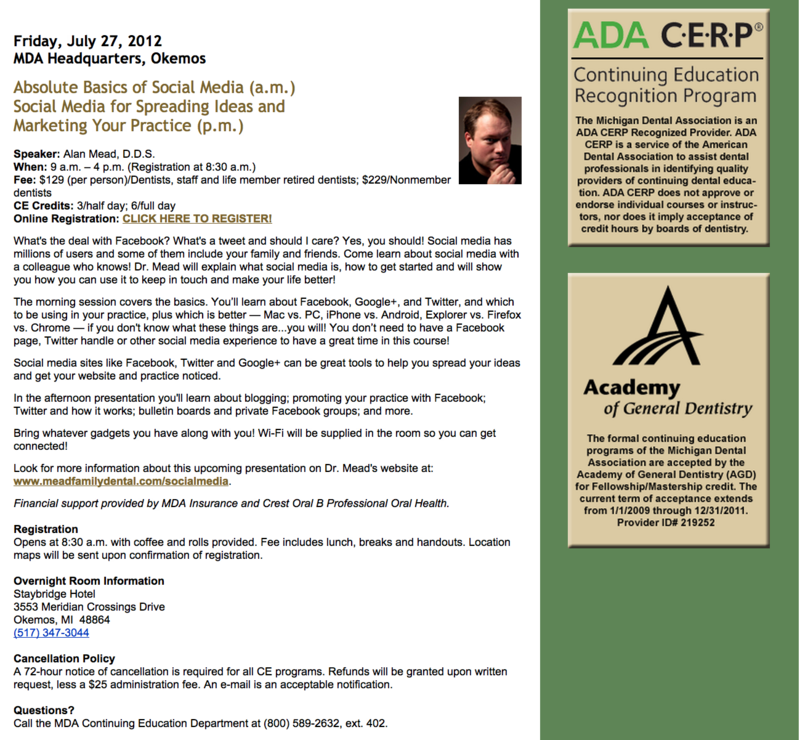 I’m very excited to tell you about a talk I was invited to give! 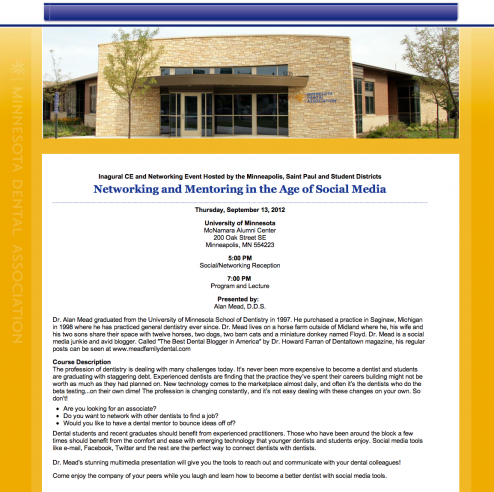 On September 13 I will be presenting Networking and Mentoring in the Age of Social Media to the combined Minneapolis District Dental Society, St. Paul District Dental Society and the University of Minnesota Student district of the Minnesota Dental Association. 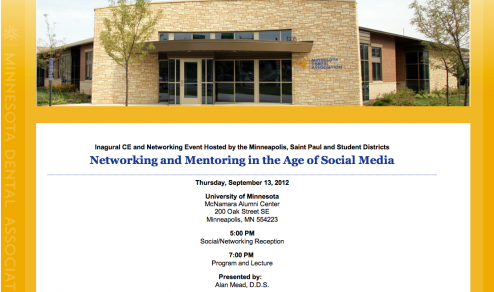 The presentation will be at the amazing McNamara Alumni Center on campus at the University of Minnesota! This will be a homecoming of sorts for me. 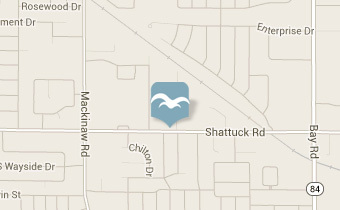 I graduated from the University of Minnesota School of Dentistry in 1997. I’m looking forward to seeing lots of old friends and new. So, if you’re in Minnesota in September, mark the date! 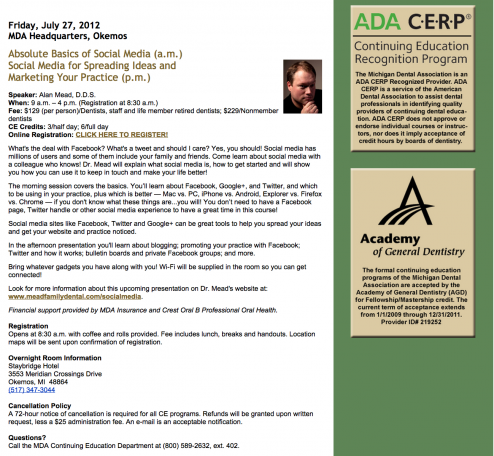 I’m going to be presenting on social media for dentists in Okemos on July 27th! Mark your calendars! Or better yet…sign up here! It’s true. 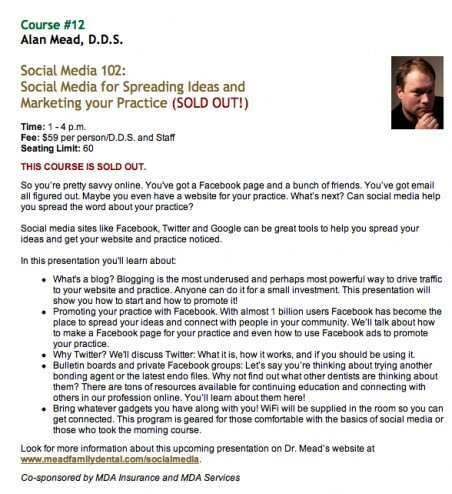 I now have a two year history of selling out! But don’t despair! 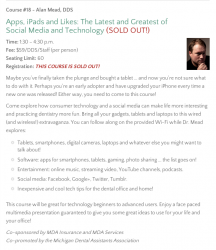 There’s still room in my Saturday courses! I’m looking forward to April! I have the honor of presenting to the Vacationland District Dental Society this evening! 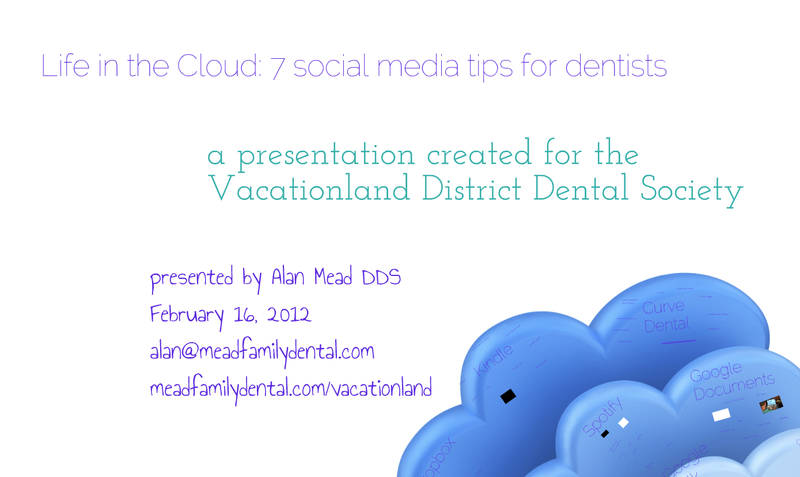 I created a presentation called “Life in the Cloud: 7 social media tips for dentists” just for them! 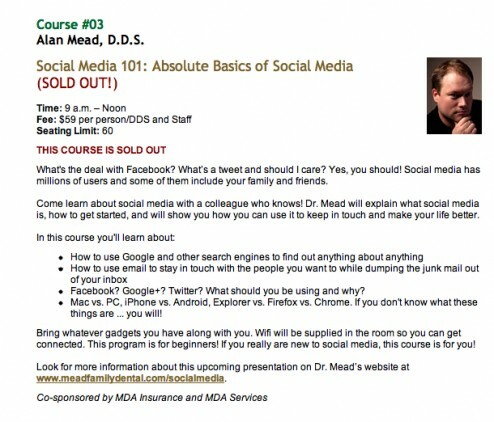 If you’d like to see what kind of fun we’ll be having you should check out the presentation at www.meadfamilydental.com/vacationland! 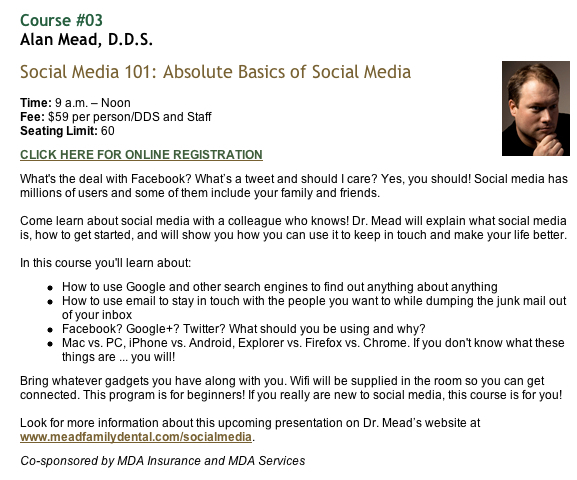 I’d like to thank the VDDS for the invite and I’m looking forward to meeting everyone! 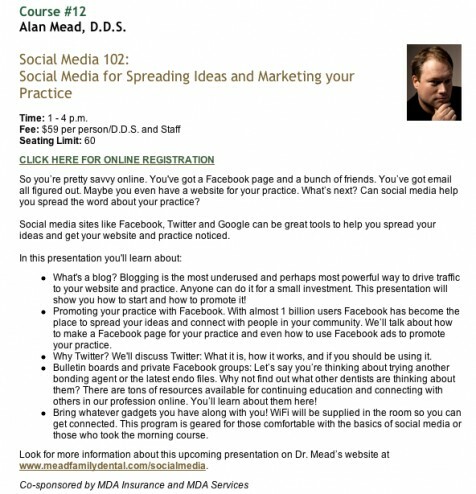 Saginaw dentist presents at the Michigan Dental Association meeting! I should be back to my normal posting schedule next week. For now, feel free to take a look at what I’ll be talking about!